6/6/06: MEGA64 ON SPIKETV? MTV? SONY.CO.JP? Hey, man! 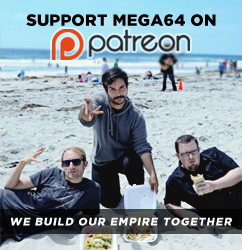 The Mega64 guys totally just sold out! They're gonna be on SpikeTV's "GameHead" with Geoff Keighley this Saturday, June 10th, at midnight! And they're gonna premiere their new "Resident Evil 4" skit. How lame! I wish Mega64 just went back to making dumb videos that no one watched instead of dumb videos everyone on basic cable watched. Pfft! Watch this preview clip of the show! It's in Quicktime... typical. Wait, MTV did a story on them too? Man, screw Mega64! So yeah, the RE4 video will go up on the site the day after it premieres on Spike. Since the Version 2 DVD comes out on July 20th, we were thinking maybe it would be the last skit we'd release onlne before the DVD is released. Lots of people asked if we'd release the "Ico" skit we showed at Game Developers Conference, but no, we decided to save that gem for the DVD. But then, in an absolutely insane turn of events, Rocco actually got an email from the team behind "Ico" and "Shadow of the Colossus," asking if they could use the Ico skit for the upcoming Japanese re-release of Shadow of the Colossus! So you better believe we said yes! We're not sure when this is all gonna go down, but you'll hear about it all here on Mega64.com!